HomeIndustry NewsWho was the mysterious Madame Valerie? Madame Valerie founded Patisserie Valerie in 1926 and, as you can read on the company’s website, it’s quite an inspiring tale. From her café in London’s Soho, the Belgian introduced continental cakes and pastries to the English. Not even the Luftwaffe, which destroyed her first cafe in a bombing raid in 1941, could stop her. Madame Valerie just set up shop around the corner. Stirring stuff indeed, but there is a problem – there’s not much evidence that the story is true. Right now the survival of Patisserie Valerie is in the balance. Administrators are hoping to sell 122 outlets, after closing 71. Its future is murky, but so is its past. Tracing the company’s history is a tricky business, not least because the owners could not supply any information. I asked Patisserie Valerie if they had evidence to support the story of Madame Valerie. They couldn’t produce anything. And no-one I spoke to while researching this piece even knew Madame Valerie’s full name. Patisserie Valerie’s website says the original shop was opened in 1926 by Madame Valerie on Frith Street. But according to an edition of Soho Clarion magazine from 1988, the first Patisserie Valerie was opened by Carlos and Laura Fonteyn in the early 1920s, at 59/60 Dean Street, a parallel street. And there is evidence supporting that. The National Archives in London holds Post Office Directories going back almost 200 years. Patisserie Valerie first appears in those directories in 1925 at 59/60 Dean Street – not on Frith Street. Electoral records for 1926 show Laura Mito Victoria Fonteyn was registered at Dean Street – supporting, but not necessarily proving, that she was one of the founders. Carlos Fonteyn turns out to be her father-in-law, and a man with some catering experience. He was the owner of Grand Patisserie Belge, also registered at 59/60 Dean Street during the 1920s. Thanks must go to Sarah Buttery, who works with the Soho Society, for helping uncover these details. There is no mention of a Madame Valerie. It is possible that she was an employee of the firm, so may not appear in historical documents like electoral, tax and insolvency records. Perhaps the Fonteyns supplied money and expertise to help the Belgian get her shop going. But so far I have not uncovered any evidence of that. However, there is evidence that the first shop was destroyed by the Luftwaffe. Air raid records show a devastating Luftwaffe raid in the early hours of 11 May 1941. Bombs fell all over London that night, but one high explosive bomb hit the corner of Old Compton Street and Dean Street. Among the properties destroyed was Patisserie Valerie. In 1942 it disappears from the Post Office Directories. Did Madame Valerie recover from the shock of that loss and start a new business on Old Compton Street, as the company’s website suggests? Well the name Patisserie Valerie does not reappear in the Post Office Directories until 1958, and at 44 Old Compton Street in Soho which, until it closed this week, was the chain’s oldest branch. For years this property had been the home of Theo Vermeirsch, described as a pastry cook. Soho Clarion magazine says he took over Patisserie Valerie and kept the name going. 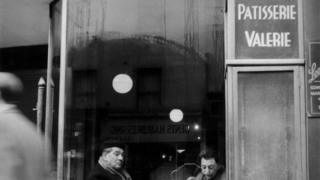 The photograph at the top of the piece is listed as from 1951, so the shop seems to have been a presence in Soho then. In trying to find out more about Madame Valerie I spoke to some former owners. In 1987 Patisserie Valerie, still with only one store, was bought by the Scalzo brothers, Roberto, Enzo and Victor. They built it up into a much larger chain and sold it to Luke Johnson in 2006. Enzo and Victor are both “confident” that Madame Valerie did exist and did oversee the Old Compton Street store. They can remember several customers who talked about Madame Valerie. Unfortunately, it’s so long ago, that they couldn’t put me in touch with anyone who remembers, or who was alive, during Madame Valerie’s era. Enzo, who now runs the Best of Italy car rally, thinks the café chain was contacted by someone claiming to be a relation of Madame Valerie, but so far Patisserie Valerie has not been able to confirm that. Perhaps with more historical research Madame Valerie will emerge from documents or memories, but from my initial sift of the evidence available, she remains an elusive figure. Do you know anything about the history of Patisserie Valerie? Tell us by emailing haveyoursay@bbc.co.uk.